Come on out and join Oscar Mayer in celebrating National Hot Dog Month on July 19 in Chicago. The newest member of the iconic WienerFleet, Super Hotdogger (with Jetpack), will go to new heights to get a better dog in every hand. The iconic Oscar Mayer Wienermobile and the Super Hotdogger, a flying jetpack, will pass out FREE hot dog samples, while supplies last with one recipe created by local Chicago chef and Food Network star Jeff Mauro. The North Avenue Beach bash will mark the Chicago debut of Oscar Mayer’s Super Hotdogger—a guy in an orange jumpsuit who flies through the sky with the help of a jetpack (which looks a bit like the one James Bond strapped on in Thunderball). The hot dog-delivering daredevil will take off at 6pm, gliding over Lake Michigan before landing on North Avenue Beach to take photos with attendees. Super Hotdogger’s special delivery will take place around 6pm t North Avenue Beach. TRIVIA: There are eight active Wienermobiles in existence today. The current full-sized Wienermobile sports fourth-generation Pontiac Firebird taillights. 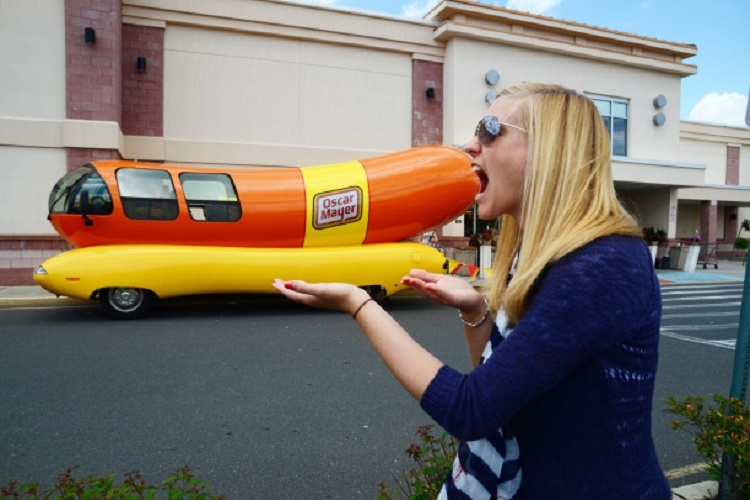 These frank fanatics even have a pretty entertaining “hotdogger blog” that documents all of these Wienermobiles’ exciting travels. So, keep your eyes peeled and favorite condiments ready for that special time when the Wienermobile comes rolling through your hood. The Oscar Mayer Wienermobile is no doubt an American pop-culture icon, right up there with Elvis and Mickey Mouse. Well, maybe it’s not that big, but you get the point. This delectable automobile has been around for nearly a century now, and with the celebration of Independence Day, a day when Americans across the nation are firing up their grills, we thought it only right to honor the Micheal Jordan of the hot dog game. From Baconnecticut to San Frankcisco, this famous frank has found its way into the stomachs and hearts of hungry Americans and others across the globe. Although it’s slightly evolved with the times, the taste and quality that these unique machines represent has never waned. In 1936, Oscar Mayer’s nephew Karl G. Mayer was the one to come up with the concept of getting in the giant wiener and driving it around. It was 13 feet and $5,000 of faux-beef, and it quickly found its way onto America’s streets and into Americans’ hearts. 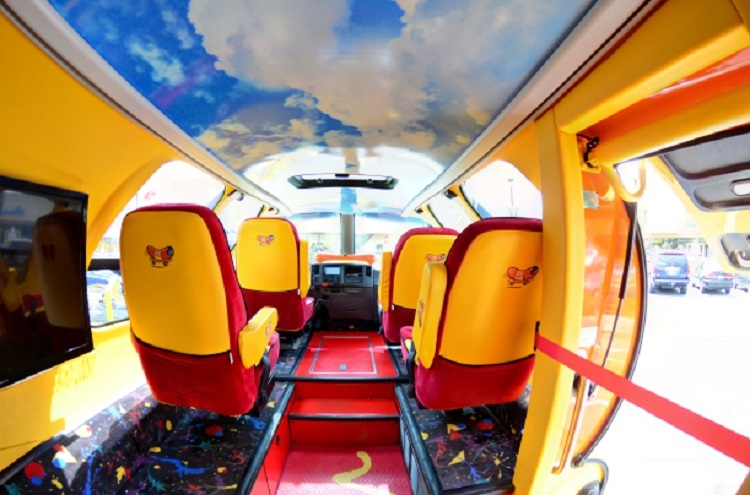 Drivers of Wienermobiles, who are known as hotdoggers, hand out toy whistles shaped as mini replicas of the Wienermobile, affectionately called Wienerwhistles. Post World War 2, gas rationing kept the Wienermobile off the road during World War II, so Oscar Mayer and the Gerstenslager Company came up with a solution. They built several new vehicles based on a downsized Dodge or Willys Jeep chassis. They not only looked cooler, but the new models were rockin’ and rollin’ with high-fidelity sound systems. 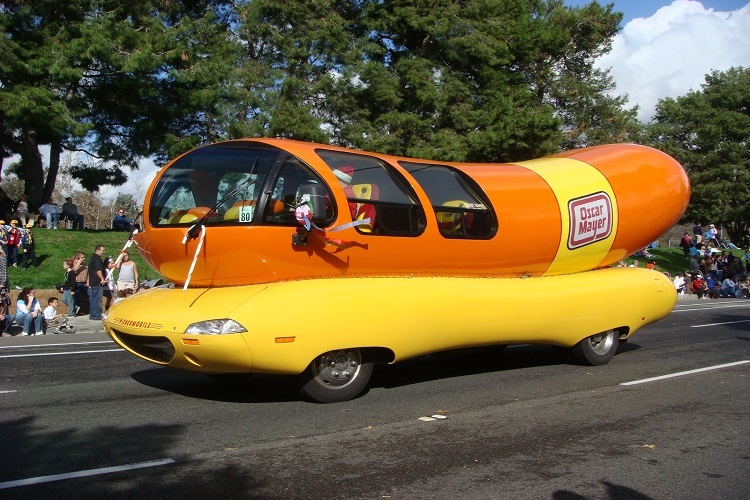 One of only five created during this bygone era can be visited at the Henry Ford Museum in Dearborn, MI at the Wienermobile Cafe. These Wienermobiles were driven by “Little Oscar,” who often visited stores, schools, orphanages, and children’s hospitals; and participated in parades and festivals.